If you were hunting for a hot-bed of heavenly boutique hotels where would you look? Try Luang Prabang, Laos's languidly lush northern outpost, where a crop of inspiring boltholes is tempting style-conscious travellers to venture off the beaten trail. In fact, Mr & Mrs Smith has unearthed more creative gems in this sleepy Mekong-side getaway than in many a self-aware major metropolis. Stylish boutique hotels in Luang Prabang abound because of the unique chemistry of the place: take years of French colonial history, throw in a dash of communist isolation and then season with Buddhist tradition. The result is charming Indochine heritage and great architectural bone structure blended with cutting-edge contemporary design and style. The intimate scale of the Old Town, and its UNESCO-protected status helps too, as does its seclusion - you still have to fly in via neighbouring Bangkok, Chiang Mai, Siem Reap or Hanoi, which keeps the tourist hordes at bay. 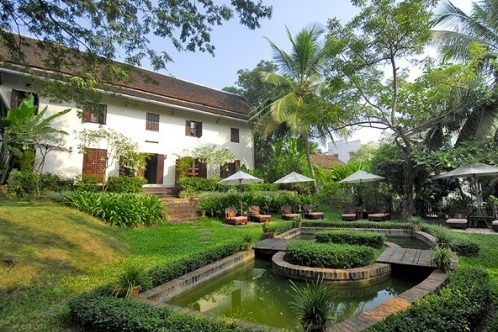 Luxurious new hotel Alila Luang Prabang is a case in point, a converted former colonial governor's mansion which once served time as a detention centre. With 23 spacious, subtle-hued suites set around a large garden courtyard and pool, it's hard to tell where the original heritage buildings end and the seamless modern additions begin. Easier to spot are the quirky prison touches, such as dramatic watchtowers topping two of the corner Pool Suites, ideal for lofty sunset views over misty mountains. As the name implies, the four Pool Suites feature private lap pools with dreamy baths and showers opening out to your own courtyard. All suites offer heavenly high ceilings, floaty net-draped beds and enveloping freestanding baths for welcome pampering. There's also a restaurant, spa and cooking school set in traditional village-style wooden Lao houses on stilts, a sultry lounge bar, and bikes for wheeling around the traffic-free historic town centre, just five minutes' away. Occupying a heritage hospital in the shadow of Mount Phousy, perfectly poised retreat Amantaka also subtly blends old and new architecture, with 24 sophisticated, suites arranged around a courtyard, 16 with private pools. The chic lounge bar segues into a colonnaded terrace giving onto the shimmering central pool, with just-so styling including striking black-and-white photos of Buddhist monks carrying out their daily rituals. For spiritual highs of a more indulgent kind, check out the sensual Aman Spa, where fragrant steam and sauna rooms and a double Jacuzzi await for quality time à deux. For a more classic take on Indochine, 25-room Satri House is another example of how intimate Luang Prabang is getting it so right in the style stakes. Lao owner Lamphoune grew up in France and brings a cosmopolitan stylist's eye to the gorgeous interiors, where every corner offers an elegantly curated vignette of archive tribal photos, tactile vases and Buddhist figurines. If you're not seduced by the soothing palette of sky-blues and mint-greens, you'll be wowed by the romantic net-draped wooden beds, vintage phones or retro fans. With an airy restaurant, two pools and a small spa, there are plenty of places to laze and lounge, with day-beds dotted in secluded spots to tempt you to unwind. With its tasty mix of rustic Lao and French cooking, Luang Prabang is also intriguing as a gourmet destination. With its tasty mix of rustic Lao and French cooking, Luang Prabang is also intriguing as a gourmet destination. Get your eye in at the mesmerising morning produce market along Souvannalath Road, where you'll see many of the ingredients served up later in the town's best eateries (fish, Mekong River weed, chillis, coriander, mint, bamboo and tropical fruit are all favourites). For aristo Lao cuisine try L'Elephant, on Ban Wat Nong, considered one of the best tables in town. Informal café-style Tamarind is another good Lao option nearby. The relaxed street-side restaurant at central hotel 3 Nagas by Alila has won props from The New York Times, dishing up delicacies such as barbecued Ping Buffalo and Mhok Het (steamed mushrooms, lemongrass and herbs wrapped in a banana leaf), mopped up with sticky rice. The hotel is also handy if you'd like to offer alms to the serene processions of saffron-robed monks who pass by at dawn, accepting handfuls of rice in exchange for blessings. Luang Prabang may be known primarily for its cultural treasures, thanks to its flock of ornate temples (don't miss arcing Wat Xieng Thong) and Buddha-filled Pak Ou caves, but it's also a surprisingly convivial shopping destination, with none of the hard-sell that can make bagging bargains elsewhere in Asia a chore. Kick off at the fairy-tale night market, illuminated by pretty lanterns, spread out along main drag Sisavangvong Road. A hive of activity from early evening, it's a good bet for sourcing pretty silk scarves, vibrant embroidered throws, hand-made paper notebooks and heavy silver hill-tribe necklaces. Further along the street morphs into Sakaline Road, where chic store Caruso Lao showcases gorgeous grainy wooden tableware and delicate textiles. Gallery and shop Ock Pop Tok, also on Sakaline, is a respected crafts centre, where you can pick up authentic pieces or even try your hand at dyeing your own scarf. With waterfalls, river boat rides and elephant treks in the rustic hinterland beyond town, there's plenty to keep you smiling in Luang Prabang - or planning your next visit before mainstream tourism transforms this little pocket of pristine luxury. To book these boutique hotels in Laos visit www.mrandmrssmith.com or call the expert Travel Team on 1300 89 66 27. For more Luang Prabang inspiration, glam new guidebook Mr & Mrs Smith Hotel Collection: South-East Asia (AU$45) is out now. See also: The Luxury Travel Bible's Top Ten Luxury Laos .